Crossbody Bag / Shoulder Bag. Gap Pink Two Handle Tote Bag made of coated PVC with leather handles and trim. It has a full width zip and an interior zipped pocket and key clip. Measurements are: 46x 28 x16 cm or 18 x 11x 6 1/2 . It has had little use and is in excellent condition but there is a very small mark on the exterior base( see photo). It comes from a pet and smoke free home. BNWT Purple Handbag . Condition is New with tags. Dispatched with Royal Mail 2nd Class. Gap quilted polyester fabric small handbag with canvas strap and zipper top. Inside zip pocket, study, stand alone base. Good used condition. Black backpack by GAP. Condition is Used. Dispatched with Royal Mail 2nd Class. GAP Single Strap Shoulder Bag. Fabulous substantial leather handbag by GAP. 100% Leather. Here is a beautiful bag from Gap, in very good condition. 100% cow leather. 1 slip pocket. Detachable long, adjustable fabric strap for cross body or shoulder wear. 1 zippered internal pocket. Very nice Gap bag in brown, nearly new, in very good condition. Here is a beautiful bag from Gap, in a hot pink colour. Brand new Gap black leather saddle bag in original packaging as seen. Interior pocket. Exterior back pocket. Adjustable shoulder strap. Popper fastening. New. Excellent condition. Lovely detail on this pink satin effect slouchy casual shoulder bag with zigzag stitching and lace ties on outer pockets and bright pink yellow lining g. Lovely bright and unusual bag Please view picture and ask questions before ordering as no returns offered as private seller. Nice clean gap shoulder bag very cute design and roomy comfy to carry. In used but IMMACULATE CONDITION! 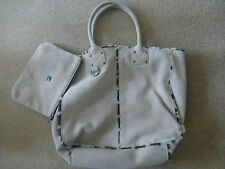 For sale I have thisFAB ladiesHANDBAG from 'GAP'. FAB QUALITY HANDBAG. THIS IS A LOVELY BLACK LEATHER BOWLING STYLE BAG BY GAP. IT HAS BEEN USED BUT NOT EXCESSIVELY AND IS IN VERY GOOD CONDITION. STILL VERY CLEAN AND TIDY INSIDE AND OUT. THERE IS A FURTHER ZIPPED POCKET INSIDE. Gap fawn coloured leather shoulder bag in general good condition, but a strap have split and been restuck with leather glue. Insidethere is a zipped pocket, a open pocket and a phone pocket. Drop of handles to top of the bag approx 25 cm. Lovely handbag from GAP. In excellent condition. Women Gap Jeans Brown Genuine Leather Bag. Lovely small brown genuine leather bag by Gap Jeans. Still in great condition. 12" wide(at the widest point), 7" high (in the middle) and 5" depth (at the bottom, when empty, including the front pocket depth). Inside there is an open topped pocket that fastens with with a press stud. The handles have seen much use and although the stiffener inside them seems to be falling apart the outer still looks good and will probably last for many years. The colour of the bag is a dark sage green. Classy black shoulder bag - Gap. GAP COTTON NAVY BLUE CANVAS TOTE, SHOPPER, BEACH BAG OR SHOULDER BAG. Condition is Used. Dispatched with Royal Mail 2nd Class. GAP green velvet slouchy bag in 70s style flower power print. Inner Zipped pocket. If there is any doubt at all regarding size. GAP suede Handbag. There is asmall fault - a cut approx 0.5 cm in the suede (see on the photo), not visible unless you look particularly for it. length (at widest point across) 40 cm (15.5"). base semi-circular shape 23 cm (9") x 10 cm (4"). Pink Wool-Mix Handbag /Clutch by GAP with Pretty Flower Motif. Popper To Close. Thank you for viewing. A pretty pink wool mix medium size bag from GAP with flower motif. Zap up any outfit from Wedding to casual accessory. Magnetic popper to close. Inner working zip pocket. Measurements in description Short strap. Inside this section there is a zipped pocket, a phone pocket and a open pocket. Main section of the bag has a zipped closure, which is then secured to the front of the bag with a magnetic snap. Length of chain strap approx 112 cm. It is polyester but feels like suede, it has 2 outer pockets, edged in white which do not fasten and an inner pocket again edged in white and does not fasten and t he handbag has ONE handle.The white edging feels like a furry material and there is also brown stitching on the 2 front pockets.A lovely handbag to give as a gift or to keep for yourself for the winter months,feels very soft and cuddly! The photos really don't do it justice, grab a bargain as it cost £20. I am clearing out a lot of shoes & bags. Womens Gap Brown Cord Bag With Leather Strap. BROWN/STONE DOG TOOTH CHECK FUR LINING. DETACHABLE PURSE INSIDE. FABRIC TOTE BAG. Gorgeous Cotton Burgundy Handbag Clutch Bag Fully Lined from Gap - New! Gorgeous plum coloured clutch bag from Gap. Lined in a lovely yellow with pocket & stitching detail.